We are a renowned name in the furniture industry for manufacturing and supplying a wide range of quality products. Using quality raw materials, our end products are durable and sturdy. We use heavy gauge C.R.C pipes in mild steel, steam pressed ply in seat/backs, PU cushion or high density foam of best quality. Our nylon base has a metal insert for extra strength in revolving chairs. Our comprehensive range of products includes the following: 1. Executive Chairs. 2. Office Chairs. 3. Computer Chairs. 4. Cafeteria Chairs. 5. 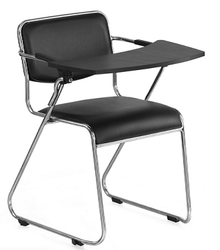 Student Chairs/Desks. 6. Lounge Chairs/Multiseaters. 7. Office Tables/Modular Work-Stations. 8. Centre/Side-Tables. 9. Cafeteria Tables/Stands. 10. Office Accessories. 11. T.V./ Serving Trolleys. 12. Bunk-Beds. Material- Cushion seat Back, Metal Seat Back and Wooden Seat Back.